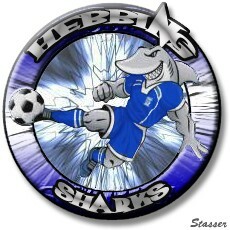 Hebbing Sharks is a Belgian club, situated in West-Vlaanderen and owned by Big_Apple. The club was founded on 15/02/2004 and started in division VI. Currently the club is playing in IV. Hebbing Sharks plays in a blue jersey (home) or in white (away). The club is named after the American town of Hibbing, Minnesota, birth place of Bob Dylan. Nevertheless the club or the manager has nothing to do with Bob Dylan. He only found out about his birthplace after the name of the club was chosen. The name "Sharks" comes from the American tradition of putting animals in the names of sportclubs (e.g. Chicago Bulls, Miami Dolphins, ...). The club's home ground is Hell's Gate Square Garden which has a capacity of 60.000. === Season 1 === The club started off in VI.460 under the name of Hebbing with a very poor team. After reading the platypus guide on http://www.hottrick.org, the manager chose to train crossing (winger). In its first season the club ended on a surprising third place. === Season 2 === The club really broke through in its second season. The club name was changed into Hebbing Sharks, the manager became a Hattrick supporter and the famous logo which depicts a shark putting down a volley was revealed. The first youth pull of the season turned out to be a big bonus: David Guerin (35458675), 17 years old and solid playmaking, emerged from the youth. He was sold for 950k, a huge amount of money for a beginning team. The money was used to strengthen the midfield, to enlarge the arena and to contract a passable coach. The Sharks crushed their opponents and ended the season with the maximum of the points, having scored 80 goals. === Season 3 === The club was promoted to V.43, a very liveley league with a lot of active managers. The Sharks took profit from their position of underdog and ended third. === Season 4 === After rain comes sunshine but after sunshine comes rain again. The third season was a complete disappointment. Allthough the team didn't play worse than the previous seasons, it didn't have any luck at all. Crucial matches were lost allthough the opponents were inferior in quality and stats. Struck by the merciless random, the players lost their confidence. The last match of the season against Royal Stelen had to be won, and at the same time Schoten had to beat The Jellabies (the biggest rival in the degradation battle) with a difference of 3 goals. The other league members wanted the Sharks to stay in V.43 and Royal Stelen gave them a helping hand by sending a very weak team onto the field. Hebbing won with 0-4 but Schoten only won with 2-3, resulting in a 7th place and degradation. It is still the darkest page in the history of the club and up till now the manager has regretted this. === Season 5 === The Sharks landed in V.403 which was no match. The manager chose to focus on the cup, and with success: the Sharks reached the 6th round which is still the club-record. As expected Hebbing became champion and promoted directly into 5th division again. 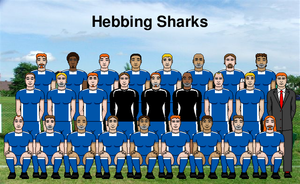 === Season 6-9 === Hebbing Sharks has been playing in V.68 for the last 4 seasons now. The team has become stronger and stronger every season but unfortunately this also counts for the other teams in the league. The club ended on a respective 6th, 6th, first and 5th place. The first place in season 8 was completely unexpected and was rather due to the weakness and instability of the opponents than to the strength of the team itsself. Nevertheless players and staff weren't less euphoric. In season 9 Hebbing ended on the 5th place with 22 points, only 3 points less than in the champion-season. === Season 10 === The objectives were the championship and if possible, promotion. Hebbing Sharks played an amazing season and became champions of V.68 with 37 points. This meant promotion to IV for the first time in the history of the club. This is the biggest succes of the Sharks in their 3-year Hattrick-experience. === Season 11 === In it's first season in IV, Hebbing Sharks managed to reach the 3rd place which is obviously a big succes. The effect of the new coach was considerable. For next season the primary objective is to stay in IV, and if possible to repeat the third place again so that the club becomes a stable IV-er. After that we can aim higher, but first we have to create some solid ground beneath our feet. Manager Big_Apple founded the BeNe Winger Federatie on 23/06/2004 after his first season in Hattrick because there was no federation for Dutch-speaking wingtrainers. The federation is still the biggest wingtraining-federation in Belgium and the Netherlands and contains more than 200 managers. Hebbing Sharks choses to train wingers with sufficient b-skills. This has resulted in some - what the manager calls - "Ferrari-wingers": wingers that are rather rare on the transfer market due to their combination of side-skills or the level of their passing. Trainees are usually bought when they are 18 and are trained 3 seasons. There is a clear policy in the structure of the club and its finances. There is a strict division between the a- and b-squad. For each position there is a replacement and the club contains no more players than needed. In buying players the first choice are Belgian players to keep down the wages. And with success: Hebbing Sharks only pays 160k a week on wages, the lowest-but-one in the league. The club is now more than break-even: profit is being made even without selling players. Hell's Gate Square Garden was first named "Hebbing Park". It has been enlarged 3 times: from 7000 to 12000, from 12000 to 21000 and from 21000 to 60000. The name is derived from the Hell's Gate bridge in New York which gives access to the Bronx, and from Madison Square Garden, the venue of the basketballteam New York Knicks. It is not exceptional that the stadium is sold out but no plans for further enlargement have been made up till now. Efstathios Chosadas (22972333): Greek winger who played a big role in the early seasons of the club. Joris Brunel (25811459): Two times top scorer with 25 and 22 goals. He was a part of the original squad and played 8 seasons for the club before retiring. He is now part of the Hall of fame and is Head Equipment Manager for Hebbing Sharks. He played 123 matches, scored 88 goals and 10 hattricks. He had good scoring and good set pieces. Lautaro Camarotta (52514724): The most successful trainee in the history of the club so far. This Argentinian was bought at the end of season 3 for 900k. He was sold 3 seasons later for 5 411 000 €. He could reach up to 7,5 stars. Valerian Simader (25811460): He was part of the original squad and is the player with most matches for the club: 142. He was sold after season 9 after reinforcements for the midfield were bought. Kai Bergmans (30575656): Scorer of 109 goals for Hebbing Sharks in 83 matches and 15 hattricks. This Belgian player is still a Shark allthough he makes part of the B-squad. He has the potential of being a future coach. This page was last edited on 24 May 2010, at 22:50.